Zero-touch customs compliance. End-to-end automated. So, what is Customs Accounting System (CAS)? 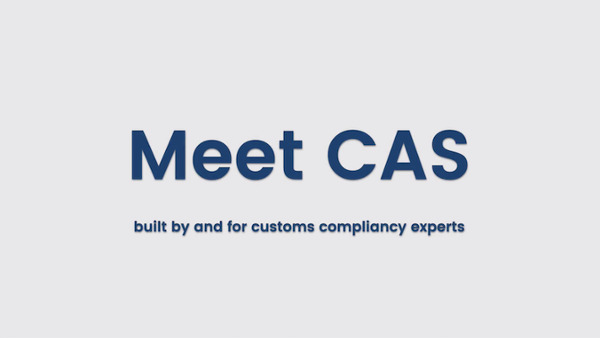 CAS is an end-to-end solution for customs and trade management. It’s designed by and for customs experts in order to drive efficiency in a time-critical and complex customs and trade landscape. CAS is a Software-as-a-Service solution, which means it is kept up-to-date with changing legislation and tariff measures automatically. It can easily be integrated with your ERP/WMS data and administration. The result? A user-friendly modular solution, that will automate your customs declarations flawlessly, that will help you become and stay compliant with new regulations effortlessly and that help you achieve significant business value fast. Want to know more about CAS? Remain up to date with changing legislation and tariff measures automatically. Combine data from logistics with administration, and streamline your processes. Choose the modules that create the most value for your business and scale up as you grow. Cut the red tape, avoid errors and automate processes to achieve impressive savings. Do you want to take charge of your customs & trade management? Cut the red tape and automate your international trade, from declarations to stock management and administration. Avoid errors, fines, delays and inefficiency with CAS. Shaun Hall - Customs and International Trade Manager, Honda Motor Europe. Customs and International Trade Manager, Honda Motor Europe. Do you want to take full control of your customs management? Would you like to know more about the Customs Accounting System (CAS)? We’d love to guide you through the details.